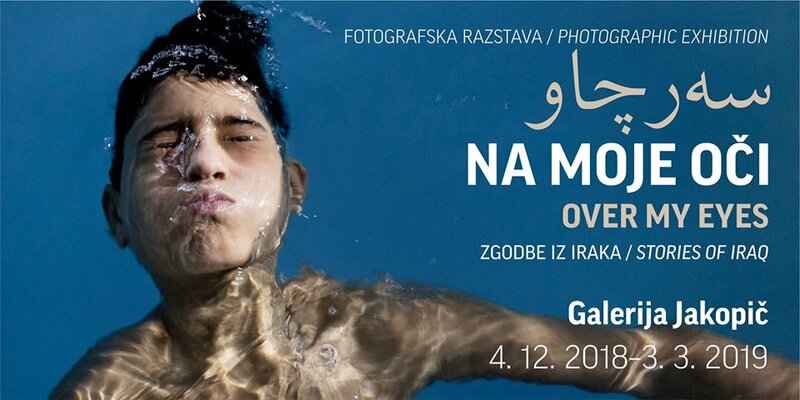 We highly recommend the OVER MY EYES exhibition featuring photographers from Iraq on display now in Ljubljana, at Galerija Jakopič from 4.12.18 until 3.3.19. We have many connections to the exhibition but we are especially honored to have one of the photographers to be part of this year’s edition No Borders Integration of Art-Art of Integration project. What is the typical imagery we see of Iraq? War, violence, militias, humanitarian crises, refugee camps – these are the images fed to us by the media and through which we “know” this Middle Eastern country that until very recently was trapped in a conflict whose effects have reached far beyond its borders. Have we ever asked ourselves whether these images give a true impression, or whether perhaps this impression has been artificially constructed? The OVER MY EYES exhibition offers an unfamiliar perspective of Iraq through the eyes of a generation of young local photographers – Aram Karim, Bnar Sardar, Hawre Khalid, Seivan M. Salim, Rawsht Twana and Ali Arkady – and from the photographic archive of Twana Abdullah, whose work spans the period from 1974 to 1992. It has been brought to life thanks to the vision of Stefano Carini and Dario Bosio, two Italian photographers who lived and worked in Iraq. The work of these photographers forms a unique and previously unseen view of Iraq and captures the fragmented picture of contemporary life across the country: from the vastness of the mountainous northern borderlands, to a multiplicity of scenes across the country, with the fading flashbacks of its recent history and the effects of the ongoing conflict. With their unprecedented access to, and knowledge of, the local environment, the photographers bring us closer to the land and its people, their stories, and a life that goes on in spite of war. Their main focus is the home region of the Iraqi photographers: the Kurdistan Region of Iraq.